Dr. Mark Laycock is an Associate Professor of Music at Wichita State University, where he holds the Ann Walenta Faculty of Distinction Endowed Professorship. In 2007, he was recognized with the College of Fine Arts Excellence in Teaching Award. In addition to serving as Director of Orchestras, he is Coordinator of Instrumental Conducting. Under his direction, the WSU Symphony Orchestra performed at the 2008 International Festival of Youth Orchestras in Zaragoza, Spain, as well as the 2008 Kansas Music Educators Association In-Service Workshop. His work as guest conductor, clinician, and adjudicator spans 16 states, including the leadership of all-state orchestras in Alabama, Iowa, Nebraska, and Washington; upcoming engagements include the Wichita Symphony Orchestra, Maryland All-State Orchestra, Oklahoma Youth Orchestra, Kansas Junior High State Orchestra, Northeast Kansas Ninth Grade Honor Orchestra, and Hastings (NE) College High School Honor Festival. He has conducted professional orchestras in Europe and Canada. Dr. Laycock recently presented clinic sessions for the Kansas Chapter of the American String Teachers Association, the Oklahoma Music Educators Association, the Arizona Music Educators Association, and the Midwest Clinic. He served as Director of Orchestras and Instrumental Music at Chapman University in Orange, California, where he led invited performances for the California Music Educators Association and at Disneyland. 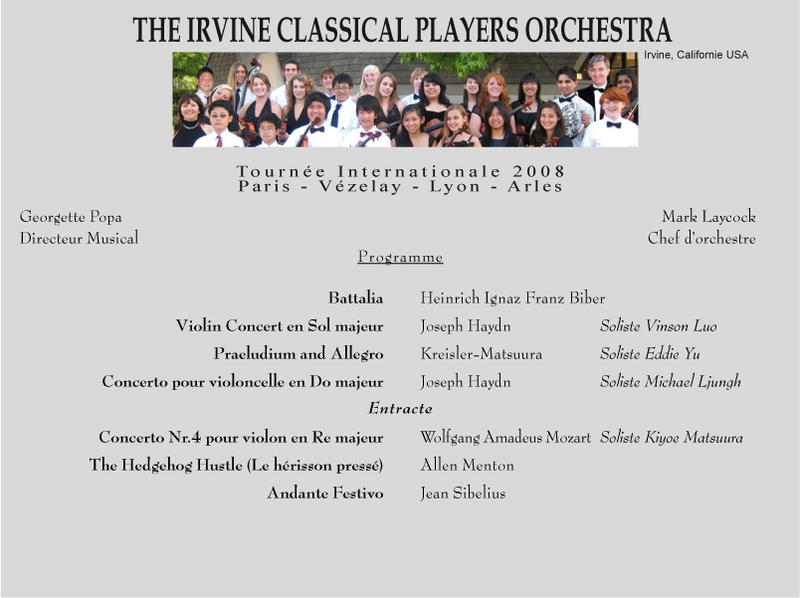 He was also Principal Conductor of the Irvine (CA) Chamber Players, leading the youth orchestra on a two-week concert tour to Italy in June 2006. From 1998-2003, Dr. Laycock served as Director of Orchestral Activities at Iowa State University and was Music Director of the Central Iowa Symphony. Under his leadership, the ISU Symphony Orchestra performed at the North Central Division Convention of the Music Educators National Association and collaborated with such artists as bass-baritone Simon Estes and pianist-composer Marvin Hamlisch. He earned a Doctor of Arts degree in orchestral conducting from the University of Northern Colorado. Dr. Laycock holds a Master of Music degree in instrumental conducting from the University of Nebraska-Lincoln and a Bachelor of Arts degree in music history and literature from the University of Southern California. An experienced educator, he was an instructor of strings and orchestra at the middle and high school levels in the Clark County School District in Las Vegas, Nevada. It takes too much time to sort out relevant online information and at times you get disappointed and tired of searching more but all of a sudden, I visited your blog and I was like on the cloud nine.